Chief Minister Pema Khandu today assured Prime Minister Narendra Modi that the BJP Government in Arunachal Pradesh will give account of every penny granted by the central government and that the government in the state has changed since his (Modi’s) visit to the state in 2015. 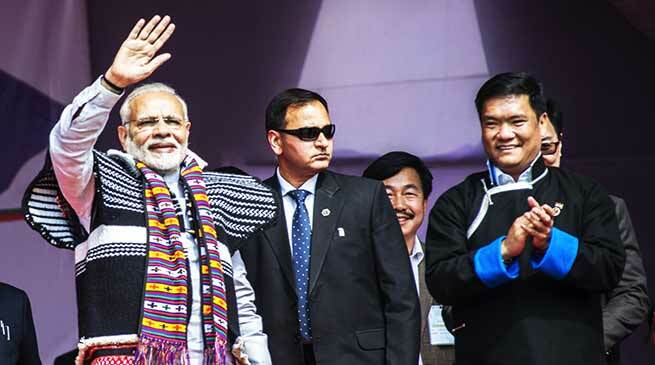 Modi was in the state capital Itanagar on Thursday and inaugurated the Dorjee Khandu State Convention Center, dedicated the State Civil Secretariat Building to the nation and laid foundation of the academic block of the Tomo Riba Institute of health & Medical Sciences (TRIHMS). Speaking at a public reception in honour of the Prime Minister at I G Park here, Khandu pointed that the present BJP government in the state took root from Modi’s fiery speech during his last visit in 2015, when the state had a Congress government. Modi had warned that the central government will make States accountable for every penny granted by the Center. “It is the responsibility of Team Arunachal to give account of every penny spent from the government exchequer and we will do it,” Khandu asserted. The Chief Minister also asserted that despite abundant resources, Arunachal Pradesh is still a resource-crunch state due to lack of proper and sound policies implemented by the earlier state governments. “Our youths have the potential to excel in all fields and take the state forward rapidly. We need to give them opportunity through programs and policies and a corruption-free government,” he said. Expressing gratitude to the Prime Minister for taking time out from his hectic schedule to visit the state twice in three years, Khandu said no other Prime Minister ever did that. He said due to Modi’s love and care for the North East, the dynamics of the region has taken a complete overhaul. Khandu said during the erstwhile regime of the Congress, North Eastern States had to visit New Delhi at least twice a month with their respective issues and problems. However, after the Modi government assumed office at the Center, New Delhi comes to the North East at least once every month, he pointed. “Since 2014, hundred-plus visits have been made to the North Eastern States by union ministers along with their officers to resolve issues pertaining to respective states,” Khandu said. Citing connectivity as the only means to all round development of the state, the Chief Minister emphasized the need to have an airport in the state capital. He requested the Prime Minister to consider sympathetically to the proposal for a greenfield airport at Hollongi near here. He also sought assistance for revamping and restoring old government infrastructure like offices, quarters and other assets that were built during the NEFA times and have long outgrown their shell life. Meanwhile, Khandu reiterated his stance to have a separate cadre of civil service officers for Arunachal Pradesh. “Ours such a distinct state with so many tribes and history. Civil service officers come here to serve only for two years at a stretch. They don’t get enough time even to understand how many tribes are here and their issues. How can they contribute to their capacity in resolving issues and support the government to take the state forward?” he questioned. “Give me a dedicated cadre of civil servants specific to Arunachal Pradesh and I promise to change the face of Arunachal Pradesh,” Khandu added. Also present on the occasion were Arunachal Pradesh Governor Brig (Dr) B D Mishra (Rtd), Speaker T N Thongdok, Deputy Chief Minister Chowna Mein, Union MoS Home Kiren Rijiju, MoS DoNER Jitendra Singh and state’s UD, Housing Minister Nabam Rebia, Assam MP Ramen Deka, Arunachal East MP Ninong Ering and State BJP President Tapir Gao.